Located in Miami-Dade County in the southern part of Florida, Doral is consistently ranked as one of the best Sunshine States in which to live and work. With plenty of top class restaurants, super stores, gorgeous green spaces, and much more, Doral is also a lovely spot to visit as part of your Florida vacation. It's barely a mile from Miami International Airport and less than 20 minutes from Downtown Miami too, offering easy transport links and direct access to one of the Sunshine State's biggest and most popular cities. Despite being a relatively small city, Doral has a lot to offer, and one of the best ways for tourists and residents to get around is via the Doral Trolley. Operated by the City of Doral, the Doral Trolley operates all through the week on separate routes, and the best part of all is that it's absolutely free! Many trolley systems all around the United States, and elsewhere around the world, come with fees and charges, but the Doral Trolley system is free for all, taking you quickly and conveniently to wherever you need to be. Riding the Doral trolley couldn't be simpler. The trolley operates on four different routes all around the city. Each route is color coded on maps and at the various trolley stops, so it's easy to distinguish between each one. Route 1 is blue, route 2 is yellow, route 3 is green, and route 4 is purple. 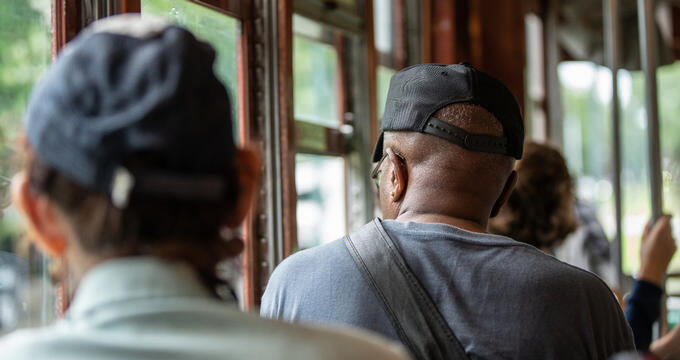 Each route has its own schedule and timings, but the most important thing to note about riding the Dotal trolley is that every route is totally free, allowing people to hop on and off as they please without needing to worry about paying any sort of fee or charge for a ticket or pass. Anyone can ride the Doral trolley, but no animals are allowed on board except for service dogs. Smoking is not allowed on board the Doral trolley either. Food and drink are not allowed to be consumed aboard the trolley and all passengers are encouraged to respect the trolleys and treat them with care and respect. All arms and legs must remain inside the cars at all times as the trolleys can pass close by to trees and telephone poles. In addition, passengers are encouraged to show respect for one another and perhaps offer their space to someone who is less physically able. Anyone with disabilities or pregnant women should be given priority for the seats on board the Doral trolley, and passengers are urged to keep the aisles and doors clear at all times to allow free movement of other passengers. You should try to be at your Doral trolley stop at least five minutes ahead of the scheduled time as the trolleys try to keep to the schedule but can sometimes be a little early or late departing from each stop. You'll see each stop clearly labeled with information about the trolley route it serves, and be sure to check the trolley itself, which will have its route and destination clearly labeled, to ensure you're getting on board the right car. If you're waiting for a trolley in the evening and it's quite dark around, try illuminating your cell phone and waving it as the trolley approaches to be sure that the operator has seen you. When you'd like to get off the Doral trolley, you simply have to pull the bell cord above your head. Buttons can be found by the windows too. The Doral trolley runs all through the year, allowing residents and travelers in the city to get around on the various routes at almost any time of day. It's a fast, convenient, free mode of public transportation that helps to make this particular city such a fun and easy place to visit and get around. However, it's worth noting that the Doral trolley doesn't operate every single day of the year. There are certain federal holidays and special occasions when the trolley service stops. The Doral trolley will not be running on New Year's Day, Memorial Day, Independence Day, Labor Day, Thanksgiving Day, and Christmas Day. The Doral troller does, however, run on Martin Luther King Day, President's Day, Columbus Day, Veteran's Day, and Black Friday, so if you need to get around Doral on any of these days and want to rely on the free Doral trolley, you will be able to do so. As for the other days, you can rely on other forms of public transportation or ridesharing to get around. The Doral trolley has four different routes in total running all around the city. Together, these routes serve dozens of different stops and can drop you at or near many of Doral's major tourist attractions and important areas including grocery stores, restaurants, and malls. Route 1 of the Doral trolley runs from the Dolphin Mall area in the southwestern part of the city along major streets of the city like Doral Blvd and 33rd St, eventually heading to the northwestern side of the city. It passes near multiple malls and parks along the way. Route 2 covers the central and eastern parts of the city, visiting areas like Downtown Doral, the Doral Government Center, and City Place. Route 3 runs along the northern part of the city around areas like Midtown Doral and offers good connection links to the Palmetto Metrorail Station. Finally, Route 4 runs in almost a straight line from the southern part of the city at Florida International University all the way up to Midtown Doral, passing by the Miami Int'l Mall along the way.